When nammAzhwAr started composing thiruviruththam, his first dhivya prabandham (divine hymn) with the verse “imaiyOr thalaivA” (leader of nithyasUris, the permanent dwellers of SrIvaikuNtam), emperumAn, who is the repository of all auspicious qualities, through his causeless mercy, revealed to AzhwAr his svarUpam (basic natue), rUpam (divine form), guNam (auspicious qualities) and his wealth of nithya vibhUthi (spiritual realm, SrIvaikuNtam) and leelA vibhUthi (materialistic realm, samsAram). Seeing these, AzhwAr realised that while he has the same entitlement as the nithyasUris to enjoy the experience of emperumAn, he is not able to enjoy it as he was in samsAram, with hurdles such as knowledge [limited knowledge, due to being in samsAram], demeanour [shortcomings in his conduct], physical form [made of five elements which are perishable] etc. He, therefore, appealed to emperumAn to sever his connection with the physical form which was a major hurdle in experiencing emperumAn. 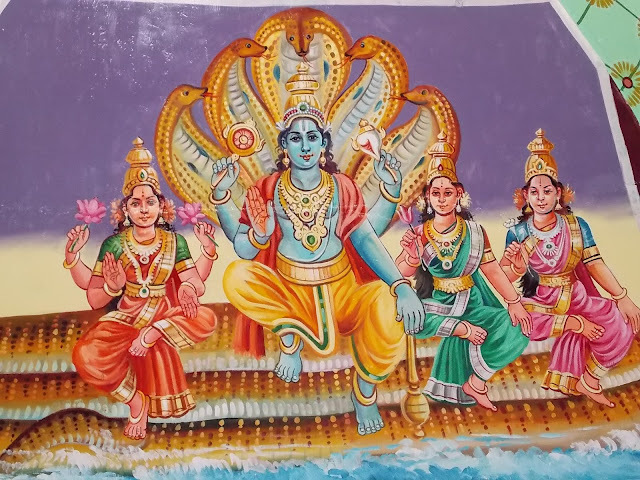 This meaning was mentioned in the first pAsuram (hymn) of thiruviruththam “poyninRa gyAnamum pollA ozhukkum azhukkudambum inninRa nIrmai iniyAm uRAmai” (I do not want to get any more of this false knowledge [that this body is Athma, the soul], bad conduct and the dirty body). While AzhwAr had mentioned this in the first pAsuram, is this meaning expressed in all the 100 pAsurams of thiruviruththam? In the 100th pAsuram, which gives the benefits to those who learn this prabandham, AzhwAr had stated “azhundhAr piRappAm pollA aruvinai mAya van sERRaLLal poynnilaththE” ((those who learn this prabandham) will not drown in this samsAram which is the reason for accumulation of sins and virtues, is deceitful, and is like a quagmire). Since AzhwAr had started saying about the ills of samsAram in the first pAsuram and spoke of the same in the 100th pAsuram, and since he said in the first pAsuram that he was making an appeal to emperumAn (adiyEN seyyum viNNappamE) and said in the 100th pAsuram that this was his appeal (mARan viNNappam seydha), it is clear that this is the meaning for all 100 pAsurams. After he had made the appeal to emperumAn in the first pAsuram to sever his connection with his physical form, since emperumAn did not accede to his request, the pAsurams in between were all expression of his distress. Why did emperumAn not accede to AzhwAr’s request in the first pAsuram? To know this, we should look at what he did when bhIshma (the grandfather of pANdavas and kauravas) was lying in the bed of arrows [in mahAbhAratha war]. In order to re-establish the righteousness which he had put in place on earth, emperumAn had made bhIshma to pronounce the same to yudhishtra [the first son of kunthi] and other pANdavas. In the same way, emperumAn made AzhwAr to compose all the four prabandhams [thiruviruththam, thiruvAsiriyam, periya thiruvandhAdhi and thiruvAimozhi] so that the world, at large, would be benefitted and the people will get uplifted, by keeping AzhwAr for a long time, in leelA vibhUthi. While emperumAn is the Lord and AzhwAr is the servitor, and it is emperumAn who can remove the hurdles of AzhwAr which prevented AzhwAr from attaining emperumAn, AzhwAr should have made emperumAn the main character in his first prabandham, thiruviruththam. Instead, he gave that honour to SrIvaishNavas. Why did he do like this? This was because, AzhwAr felt that only SrIvaishNavas can help him in uniting with emperumAn and because SrIvaishNavas only should be attained in both this realm and in the spiritual realm, as mentioned in periya thirumozhi 7-4-4 “pErALan pErOdhum periyOrai oru nALum pirigilEn” (I cannot sever myself from those great people who constantly recite the divine names of the emperumAn who is the head of nithyasUris). Also, just as mentioned in SrI bhagavath gIthai 10-9 “machchiththA madhgathaprANA bhOdhayantha: parasparam I kathayanthaScha mAm nithyam thushyanthi cha ramanthi cha II” (keeping their minds firmly established in me, keeping their lives in me, constantly telling one another about my auspicious qualities, my devotees are always happy and enjoying), AzhwAr made the SrIvaishNavas, who help each other in experiencing emperumAn, as the main character in his first prabandham. What did emperumAn do for AzhwAr in the second prabandham of thiruvAsiriyam? He knew that AzhwAr cannot sustain himself if emperumAn, even if he does not sever AzhwAr’s connection with his body, does not create any enhancement in his state compared to the earlier state. Hence, he brought about a clarity in AzhwAr’s knowledge so that AzhwAr could experience and enjoy emperumAn’s svarUpa, rUpa, guNa and vibhUthi in samsAram itself, in the same way that nithyasUris enjoyed these in SrIvaikuNtam. Thus AzhwAr enjoyed these in thiruvAsiriyam. What is it that AzhwAr mercifully declares in the third prabandham, periya thiruvandhAdhi? The worldly matters of Sabdham etc (five sensory perceptions), when experienced, will not be such that they could be termed as great when they are being experienced. The person who experiences these cannot state clearly as to what he had experienced (they will be so lowly). On the other hand, matters related to emperumAn will be such that what has been experienced will be beyond description and what is left to be experienced will be still huge [it is not possible to experience emperumAn completely]. Hence, just as he started the first pAsuram with the verse “muyaRRi sumandhu” (being involved enthusiastically), he sang the last verse “moy kazhalE Eththa muyal” (try and praise the divine feet of emperumAn), thus signifying that his enthusiasm for experiencing matters related to emperumAn increases proportionately to the greatness of emperumAn. We will take up the 1st pAsuram of this prabandham, next. This entry was posted in iyaRpA, periya thiruvandhAdhi on October 6, 2018 by T N Krishnan.